Created in 2012 by presidential decree, the Zero Hunger Pact aims to reduce malnutrition rates in the country by 10% in four years. The program's health care and education components are designed to break the cycle of poverty and create better opportunities for families, with a focus on groups living in poverty and extreme poverty. The municipal government of Tajumulco formally adopted the healthy municipalities strategy and designed and implemented a local health plan to address social determinants of health in alignment with the Zero Hunger Pact. Political commitment. Created by a presidential decree, the Pact enjoys political commitment at the highest levels of government. Separate structure. The National System for Food and Nutritional Security (SINASAN) was established under the Office of the Vice President of the Republic. It is comprised of the National Council for Food Security and Nutrition (CONASAN)— an inter-ministerial body that includes nongovernmental and private sector entities—, the Secretariat for Food and Nutritional Security (SESAN), the Social Consultation and Participation Forum (INCOPAS), and the Group of Supporting Institutions (GIA). An Inter-agency Technical Committee was established as a national supervisory body with experts from the Ministries of Environment, Health, Education, and Agriculture, international cooperation agencies (PAHO/WHO, GIZ, UNDP, USAID), and key associations (National Association of Municipalities). At the local level, Tajumulco has set up a Municipal Commission on Health, Food Security and Nutrition (COMUSSAN) to coordinate implementation of the Zero Hunger Pact. The City Council, represented by the council member for health, chairs the Commission and provides legal backing for its activities. Participation of other sectors. In addition to the sectors represented on the Inter-agency Technical Committee, the Zero Hunger Pact is linked to family benefits programs such as Ventana de los Mil Días, and Triangulo de la Dignidad. Separate budget. CONASAN member institutions include food security activities in their budgets. By presidential decree, the Ministry of Finance's general budget must include an allocation of at least 0.5% for food security and nutrition programs. The Municipal Health Plan also includes budget allocations for these activities. Focus on reducing inequity. In its initial stage, the Zero Hunger Pact targets municipalities most affected by chronic and acute malnutrition. Municipal plans tailor activities to the needs in each region. The target municipalities present high rates of extreme poverty and children with chronic malnutrition, a problem that affects 49% of children under age five nationally. Intersectoral action. COMUSSAN serves as the vehicle for intersectoral action at the municipal level. The Secretariat for Food and Nutritional Security (SESAN) establishes operational mechanisms for implementation of the national action plan with the participation of the relevant government agencies, national and international cooperation agencies, the private sector, and civil society. The overarching objective of the intersectoral plan is to ensure healthy living conditions for people, especially in relation to access to food. Public policy. The Zero Hunger Pact contributes to public policies that impact health. The health sector coordinates the efforts of SESAN and the municipality to strengthen COMUSSAN and to design a municipal health plan based on social determinants of health. COMUSSAN, in turn, has identified policies and regulations that need to be updated (solid waste management, trails, construction) and its plan includes proposals for actions by municipal authorities. Evidence of results. The Zero Hunger Pact is a relatively new program that has yet to generate scientific evidence of its results. It has identified preliminary successes including the speed at which municipalities formally integrated the program into the Healthy Municipalities Strategy for implementation. At the central level, the 2012-2015 planning includes a results-based management plan for evaluation and monitoring of the strategy. Additionally, the National Institute of statistics led a national survey on the impact of the Pact in late 2012 to measure its efficiency and provide a basis for determining coverage in 166 of the 334 municipalities that were considered as priority. Social participation. Community participation is a cross-cutting aspect of the national strategy. At the local level, it plays a key role in identifying needs and facilitating community-based activities. Community representatives were actively involved in implementing the plan for health, food security and nutrition. The Zero Hunger Pact in Guatemala and its implementation in the municipality of Tajamulco, is a good example of how a national policy can be adopted and implemented locally through intersectoral cooperation. The Pact intervenes in the social determinants that generate malnutrition and inequality, improving access to food and nutrition of children in the municipalities and most vulnerable populations . 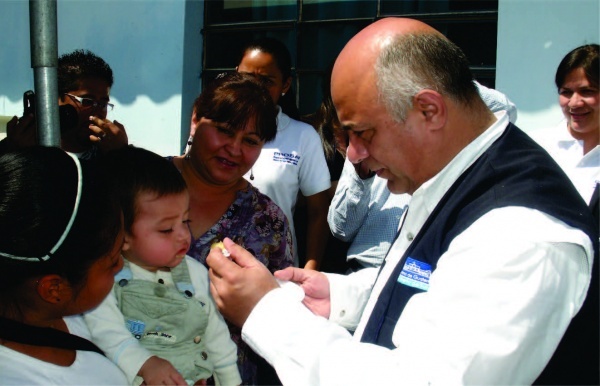 Born of a Presidential decree , it is echoed in the municipal government of Tajamulco , and is coordinated by the Health sector through its actions in food and nutrition security .